[T]he river is already festooned with parks, another new park is now being built right across the river as part of the 195 corridor – and the proposed park that would be lost suffers from extraordinarily poor design, both from the aesthetic and the practical standpoints. I refer to the image at the end of this post, which depicts some sort of jiggety-jaggety bandstand or whatever that contraption is that architects Epstein Joslin paraded before the I-195 Relocation District Commission’s public space subcommittee. 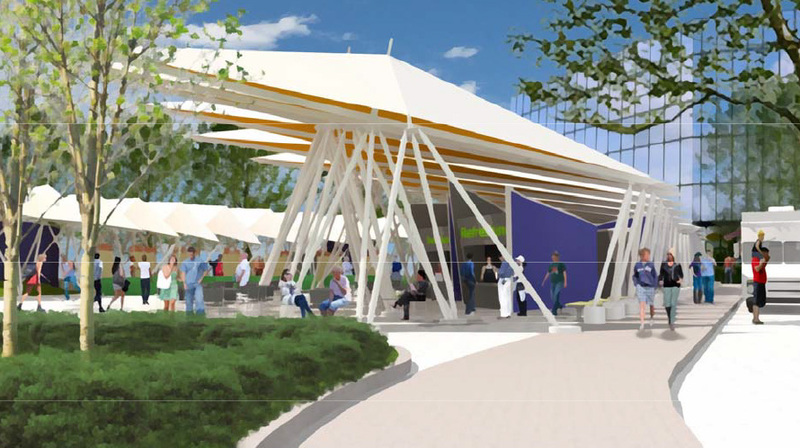 The design was criticized by members of the subcommittee, and it may not still be part of the park plan, which is running way behind. But this is what you risk when arguing for a public park these days. The poor practical design has to do with the failure to bring the river walk under the west end of the pedestrian bridge. That’s not the only flaw but others can be read in my post “Hard to build an unnatural park,” written well before the stadium issue emerged. But a waterfront that boasts Roger Williams Memorial Park, State House Park, Memorial Park and nearby India Point Park – not to mention the park being built right across the Providence River from the park/ballpark site – is not a waterfront in need of more parks. Parks we have aplenty – festooned, as I wrote in “Water taxis for the stadium?” – but we have no sites for public or private outdoor meetings, rallies, concerts or other bread-and-circuses entertainment. To swap out one public park for one such useful facility – useful beyond the provision of sport – seems like a good deal to me. That is, if it can be done without public subsidies heaped on the back of the Rhode Island taxpayer. This entry was posted in Architecture, Art and design, Development, Providence, Urbanism and planning and tagged Downtown, Leadership RI, PawSox, Providence River, Public Space, Sharon Steele, Syd McKenna, Waterfront. Bookmark the permalink. There are parks… and then there are walks posing as parks. Right now it looks as if the east and west sides of the river abound in green swards of epic proportion. But, as David pointed out a moment ago, projects have been proposed for a number of parcels on the west side. Several are well-into the due diligence stage. Thanks to the tax abatement agreement from the city council, developers now know what “the deal” is. Soon those open spaces are going to be surrounded by construction barriers, the wide-open spaces will start to disappear, and my dog will no longer have the running room to which he’s become accustomed. If the stadium goes in, the only running room left for Cyd McKenna will be the walkways along the river’s edge. But, hey! there will be room for the nice jogging loop she thinks would be cool, but no open space to sling a frisbee… to fly a kite… kick a soccer ball… no place for the nearly 1,000 students who will be moving into residences on Chestnut St. and next to the rejuvenated power plant to do what students do in their spare time or for the new residents at 95 Chestnut St. and 44 Hospital St. when those projects go forward. Worth mentioning, too: all the new residents within an easy walk/jog at the Arcade, the Providence G and its sister project above The Dorrance. Is it true that when the PawSox folks say they will provide four acres of open park for the public around the stadium, they include the already existing walkway from the Irish Famine Memorial to the beginning of the site they want us to give them? How many acres of open park will they actually create? Any wide open space? Or just a narrow walkway posing as a park hemmed in by river on one side and stadium outfield wall stretching the length of the site. Will their park do double duty as a staging area for people waiting to go through the turnstiles inyo the ball park? Oh, but that won’t bother us at all during the 75% of the year that the stadium sits empty and idle, like a beached whale on the river bank. Lew, I disagree with almost everything you have said. But to top it off you still did not address the existence of non-linear parks along the waterfront, plus the new park on the east side of the river, which will be two acres, plenty for frisbee throwing. In my list of parks along the river I did not mention the linear park, but I could have. Not everybody uses a park to throw frisbee or let a dog run. Some people walk through or sit in parks. I will get back to this later because I have to go somewhere. I am back, but I see there is little else to discuss. Yes, putting a stadium where a large park would indeed prevent frisbee throwing and dog running there, but you have not responded to the question raised in the post you reply to – which is that there are several other parks on and near the river where you do have wide open spaces. The State House grounds, Roger Williams Memorial Park, Memorial Park and India Point Park all fill that bill. And yet another park large enough for those purposes is being built right across the river. So why is this one as vital as so many seem to believe? The fact is it is not vital – precisely because all these other parks, not narrow linear parks but big grassy parks, are available for all of those purposes and more. By exaggerating the need for that one park, opponents are arraying themselves against a possible outdoor public gathering place that is unlike anything the city has. There may be good reasons to oppose the stadium aside from what the deal may look like, but one of these good reasons is not the necessity of that one park. What say you, Lew? What I’d say, after having legged it over the Point Street en route to pick up a prescription at Campus Fine Wines (Advt. ), is that the new park across the river is an ornamental continuation of the strip park, criss-crossed with paved walkways. Hardly the kind of open field you seem to think it is. As far as the State House grounds, Roger Williams Memorial Park and Memorial Park, they hardly fit the bill as recreation ground. They offer wonderful green spaces, to be sure.Tree-filled. Nice places to sit, maybe even picnic. Toss a frisbee in there and the catcher will likely wrap him or herself around an oak. Memorial Park will soon be so filled with memorials that you won’t be able to swing a cat in there without knocking the top off a statue or menacing a memorial. India Point Park is nifty, and, as Sharon Steele said last night, it is packed much of the time with happy people up to all sorts of activities. To respond to Tapestry Comm., I reiterate my nagging feeling that that 3-acre park is part myth, part statistical exaggeration. 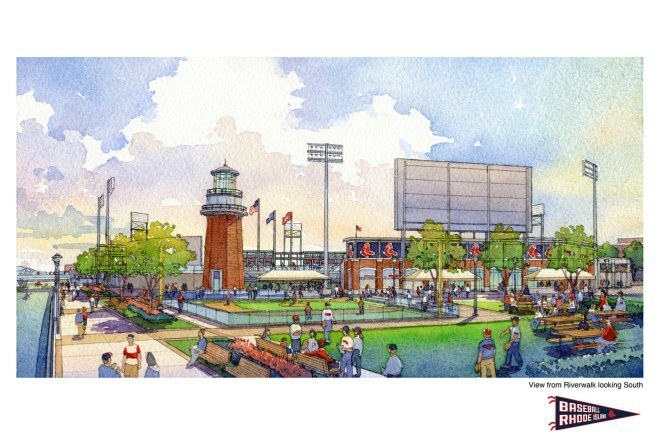 Guess I’d best take a closer look at the PawSox proposal myself to be sure of that. Finally, a clarification: ignoring the damage the move would do to poor Pawtucket, I am in no way opposed if the owners want to spend their own money on a spiffy multi-million dollar ball park on a piece of vacant land in Providence. Just not on the prime piece of land they made the grab for on the river’s edge. All across the country, cities are reclaiming riverside land from centuries of befouling, despoiling, industrial barricading and other ways of keeping the public out. Those cities are richer for it. Very nice try, Lew, and you might be right regarding Memorial Park, and we don’t know about the new cross-river park or the stadium add-on park, but you are definitely wrong about Roger Williams Memorial Park, where I have indeed myself many times thrown frisbee over the years, and there is lots of room to run, and about the State House grounds, which also offers great frisbee territory, though hillier. You need not run into trees unless your frisbee partner has murder in mind. (By the way, I grew up throwing frisbee at distance up and down a parked car- and tree-lined Rodman Street in D.C., so I would like to claim both Memorial Park and even the tightest confines imaginable for cross-river and add-on parks as prime frisbee land.) But India Point Park by itself defeats your argument. It is always active but never packed. Even with crowds on July 4 there is always room for even the most ambitious tossing of the frisbee. With India Point Park there we don’t need another big park. But I would argue that on top of India Point Park, several other parks add sufficiently to our superfluity of parks – admirable in itself – and altogether they mean that losing the land for a park to the stadium would be nowhere near a terribly significant loss if it means gaining something we now lack (an outdoor public gathering place), which, in addition, as a sports venue, would do more to make the 195 corridor attractive to high-tech owners and employees than yet another park. Here a park, there a park, everywhere a park! Good for pointing out that there is another park being planned just across the river from the one proposed instead of the stadium. If you read Ethan Kent’s 10 Qualities of a Great Waterfront – it seems as though the ballpark/multiuse park hits them all! Kent was the consultant hired for the event last night. http://www.pps.org/reference/10_qualities_of_a_great_waterfront/ – The stadium creates a 3 acre park at the ‘north’ end that is open 24/7 (only closed off during games) as well as a riverwalk, where people could even watch the game without paying. Think San Antonio? Maybe? Closer? Let’s Play Ball! – and More!